The first use of the name Rambler for an American made automobile dates from 1897 when Thomas R. Jeffrey of Chicago, Illinois and builder of the Rambler bicycle, constructed his first prototype automobile. 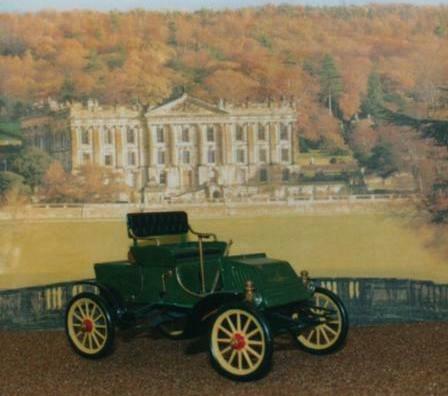 After recieving positive reviews at the 1899 Chicago International Exhibition and the first National Automobile show in New York, Jeffrey decided to enter the Automobile business. In 1900, he bought the old Sterling Bicycle Co. factory in Kenosha,Wisconsin, and set up shop. Jeffrey started mass-production of his single cylinder 'Runabout' in 1902 and by the end of the year had produced 1,500 motorcars, one-sixth of all existing in the USA at the time. The Thomas R. Jeffrey Company was the second largest auto manufacturer at that time, a year after Oldsmobile had started masproduction of the 'curved dash', and a year before Henry Ford started Mass production. Rambler experimented with such early technical innovations as the steering wheel, as opposed to a tiller, but it was decided that such features were too advanced for the motoring public of the day, so the first production Ramblers were tiller-steered. Rambler innovated various desgn features and was the first to equipe cars wth a spare wheel-and-tyre assembly. This allowed the driver, when experencing a common puncture, to exchange the spare wheel and tyre for the flat on. In 1914 Charles T. Jeffrey, Thomas R. Jeffrey's son, replaced the Rambler name with "Jeffrey" in honour of his now deceased father. In 1916 the Thomas R. Jeffrey Company was purchased by Charles W. Nash ans became Nash Motors Company in 1917. This cars was made in the early 1980s so is brush painted with Humbrol enamels and built straight from the box. Hawk kits were reasonable for their day but lack any refinement. Today (2012) these kits would be barely acceptable, but they do still make a great basis for a model if you are prepared to spend the time on them.